One of the topics I get asked about the most is choosing the right finish for a given project. Finishing your leather is a very important step and can make or break your end result. From my early years working closely with Harry Weaver to my experience as a production manager at Weaver Leather, I have learned important lessons about what works, and maybe more importantly what doesn’t work. I’ve also learned a great deal from customers like you through the years. It’s always good to hear your experiences and learn a new tip or technique. I love the way this product gives your product a rich, two-toned patina. However, sometimes Fiebing’s Antique Finish can be a little too thick when you receive it or become dried out from sitting around the shop. This issue can easily be resolved by simply adding a bit of Fiebing’s Tan-Kote to thin it to a consistency that will work best for your current project. This technique will work on all the colors. Simply add a small amount of the Fiebing’s Tan-Kote, check the consistency and continue adding small amounts a little at a time until you reach your desired consistency. It’s easy to restore a smooth surface on the back of skived leather simply by using Gum Tragacanth. I recommend applying the Gum Tragacanth with a sponge and then rubbing it in with whatever you normally use on your edges. Just as this product is used to slick edges, it can also be used to slick the back when you have an exposed skived surface. A question I get frequently is what sealant I recommend. A few years ago, we decided to do our own experiment in our shop to settle the debate. We laser-engraved three leather coasters and put a different sealant on each one. We allowed the finish to dry overnight and then puddled water on top of each one the next morning. Bee Natural RTC Sheridan Resist and Finish outperformed all the rest! 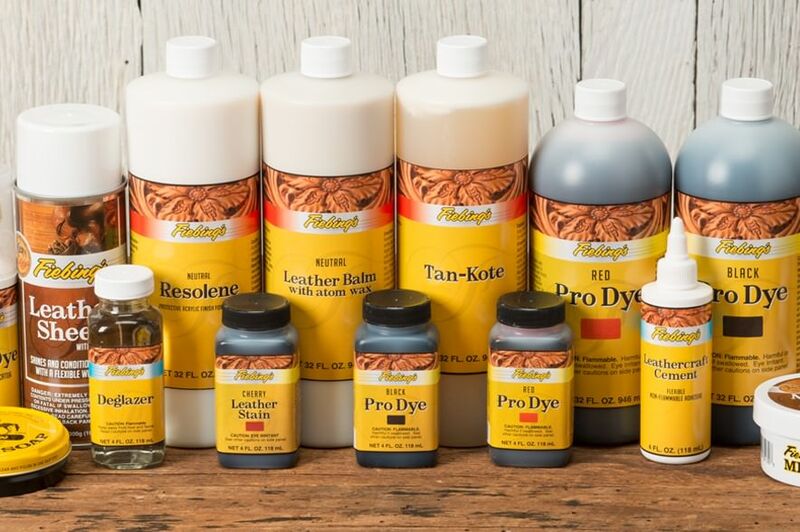 This top-notch sealer has become a favorite of belt makers everywhere for sealing in the color of their leather and making darker leather colorfast. A universal concern of belt makers is the risk of color transfer of dark belts to light-colored or khaki pants. Using RTC will give you more peace of mind knowing that your final product will resist color transfer. I hope you find these tips helpful. Choosing the right finish and utilizing the right techniques are the keys to consistently successful end products.